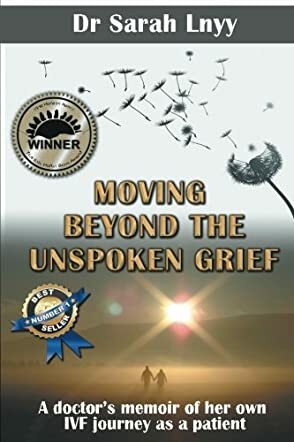 Moving Beyond The Unspoken Grief by Sarah Lnyy is an autobiographical account of one doctor’s journey of IVF and everything it involves toward having a child. The book begins with an introduction to Sarah, who is a medical doctor herself, and her experiences in medical school and how she and Sam, her husband, met. From there, the majority of the book is devoted to their dream of having a child and their inability to conceive a child naturally, which leads them to the IVF or In Vitro Fertilization option and all this entails. This book is broken down into clearly structured chapters and the physical and biological process of IVF is explored in detail, along with the emotional changes and aspects of it. I thought Moving Beyond The Unspoken Grief covered the topic of IVF pretty comprehensively and more importantly, being a doctor herself, Sarah is able to simplify the process and the technical terms for readers. I also appreciated the fact that she has highlighted and spoken about not just the biological and physical processes involved, but also the impact it has psychologically and emotionally on everyone involved. To have a child or not is a personal decision and Sarah respects the choices of those who don’t necessarily want to have children. Adoption is another wonderful thing to consider. However, this book is simply her own personal narrative of wanting to have biological kids and, for anyone considering IVF, I think this book would be quite useful.